Jordan Ingram interviewed Oregon Football offensive line coach Steve Greatwood yesterday for FishDuck.com at the University of Oregon’s Hatfield-Dowlin Complex. 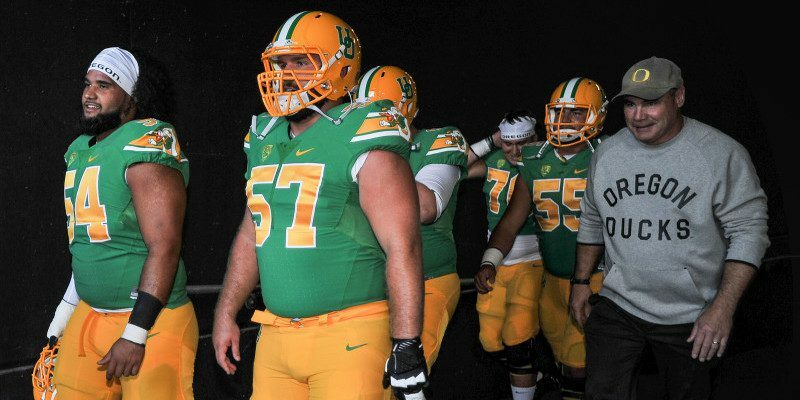 An offensive line often gets little or no credit for a football team’s success – and with a spread team that scores points in bunches, that underappreciation is even more true. 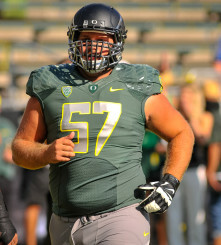 But no group is more paramount to Oregon’s success than the offensive line. After last year’s injury-filled season and the departure of three starters from last year, this spring is about building depth and improving the execution by the offensive line. Doug Brenner will be healthy for the start of the 2015 season. 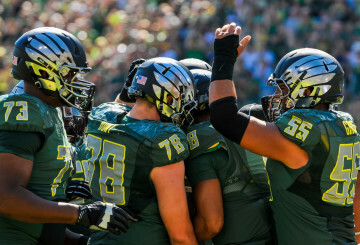 Oregon lineman celebrate after a touchdown. The injuries the Ducks’ O-line suffered last season should help Oregon better prepare for any similar occurrences this year. But coach Greatwood hasn’t looked ahead to the fall just yet. “I’m excited to get into fall, but I’m excited to continue to watch us grow in the spring. I enjoy this time of year. I continue to watch improvement both technically and physically, really counting on these guys to have a great off-season. The 2015 season is just on the horizon, which means it’s almost time to chase another Pac-12 title and another berth in the College Football Playoff. But for now, much like Steve Greatwood, the focus is on spring practice and the May 2 spring game.